Made with organic safflower oil infused with pure essential oils, our hand-crafted soaps bring the exotic aromas of the Silk Road to your bath to pamper you and entice the imagination. All of our herbal soaps are luxuriously creamy and naturally fragrant in 6 Silk Road aromas: Ottoman Spice, Arabian Sage, Mint Mahal, Hagia Patchouli, Lemon Oasis and Turkish Lavender. Lavish yourself in the sumptuous comfort of our hand-loomed Turkish Bath Towels. Woven in the centuries-old Pestemal tradition, our towels are soft & beautiful, and bring the luxury of a Turkish Spa into your home. Bringing you the best of classic and modern designs, our carpets reflect the beauty and craftsmanship that adorned both sultan palaces and Bedouin dwellings. Each carpet is a unique, hand-crafted masterpiece that brings truly worldly elegance to your home. Please contact us for more information and orders. The journey of our vintage Patchwork and Over-dye carpets begins in Turkey where we repurpose hand-woven, semi-antique carpets and transform them into contemporary Patchwork and Over-dye works of art. From the earth-tones of a traditional Patchwork to the vivid colors of a modern Over-dye, a one-of-a-kind design can be created for every pallet. Each carpet is custom created and begins with your color selection. 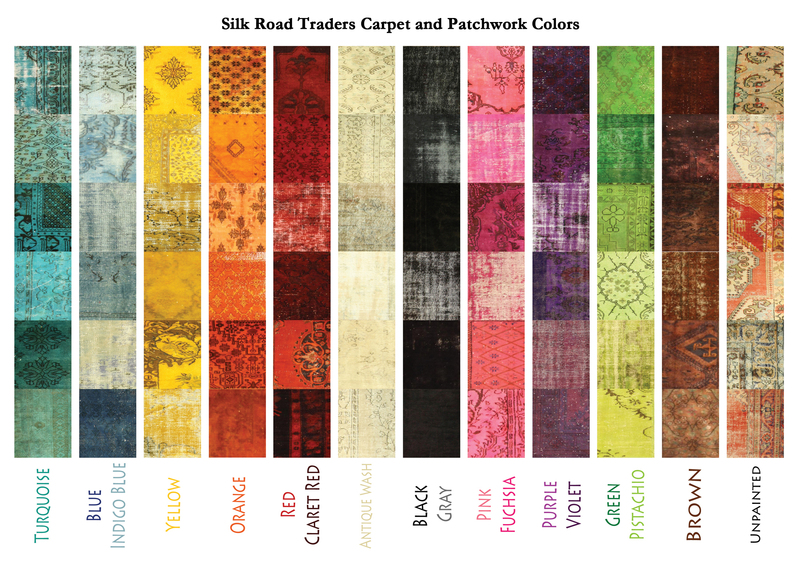 Please browse our patchwork and over-dye color chart for the wide variety of choices available for your home or business. Adding richness and color to please the eye and warm the heart, hand-crafted textile pillow cases bring worldly individuality to your home with elegant Ikat designs in silk and velvet, geometric Kilim patterns in wool, and floral Suzani in silk and cotton.